The previous Mini Cooper S was an angry little thing. A snarling turbo petrol engine mated to a rock hard chassis meant it was a huge laugh on a smooth road and an equally big pain to live with on our pothole ridden roads. A fun but ultimately flawed car in our environment. The new one however - that's a little more of everything. It's bigger, more powerful, more luxurious and ultimately more comfortable. Which begs the question, is the Mini Cooper finally a reasonably logical buy over luxury sedans that cost as much? You don't mess with an established formula and the new Mini is instantly and undeniably a Cooper, albeit a more modern looking one. Smart LED lamps at the front and rear keep the otherwise iconic design up to date. Those with a keener eye will notice that the car has grown a fair amount and is now as long and wider than a Swift. Park an original Mini alongside and it will be shockingly small in comparison. The story continues on the inside. The theme is similar to the last gen but everything has been worked on and feels more luxurious. The large circular central dial remains but it now houses an infotainment screen while the instrument cluster has been moved behind the wheel. The attention to detail is impressive - every switch feels high quality and you do get the sense of being in an expensive machine, something the old car didn't offer. I especially love the aeronautical style toggle switch that starts the engine. The driving position is adjustable and comfortable for a range of driver sizes. Rear space has improved over the old car and while it is still cramped, passengers can be squeezed in. One of the biggest achievements with the new Mini is that while it feels substantially richer and more premium it retains that unique feeling that nothing but a Mini can offer. Besides the size, another big change has been made to the engine. The new 2.0-litre BMW sourced Twin Power (that's BMW-speak for twin scroll and it's not a twin turbo setup) turbo engine is considerably larger than the old 1.6-litre turbo four. Power hasn't risen by much - 192PS vs 184PS but torque sees a big jump of 40Nm to 280Nm (300Nm momentarily under overboost when in Sport mode) and it's available lower in the rev range. 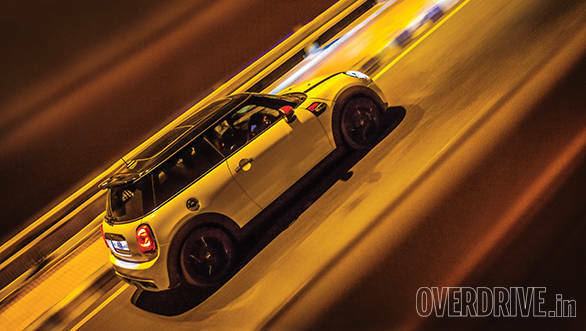 While the world downsizes, Mini is going in the opposite direction, and the car is better for it. There's more shove available everywhere in the rev range and the Mini is willing to surge ahead with less inputs at the throttle. 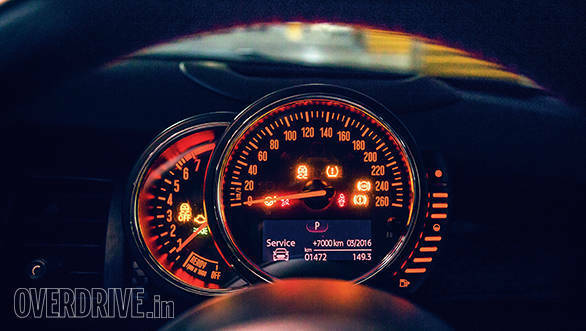 Lag is quite restrained and the Cooper can generate strong momentum from anything above 1,800rpm which makes it a doddle in traffic. But when the opportunity arises, there's a controlled explosion of power available from the engine. Cross 3,500rpm and the otherwise grippy Hankook front tyres engage in a pointless battle with Mumbai's tarmac. First and second gear are a flurry of wheelspin with the front tyres being repeatedly reigned in and released by the ESP as it desperately tries to bring things under control. All this accompanied by a loud 'braaap' from the twin exhausts and a nice pop on upshifts. At low speed when the wind isn't overwhelming you can also hear a lovely whoosh from the turbos on lift off or gear changes. The gearbox remains a 6-speed automatic but it is vastly quicker and more intuitive. 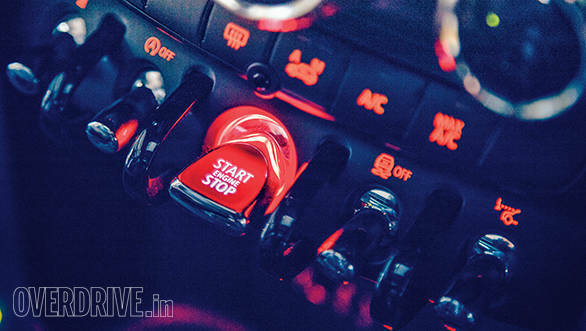 Opt for the Steptronic Sport gearbox (which of course this car has) and you get paddle shifters and launch control. A retractable heads-up display is also an option. 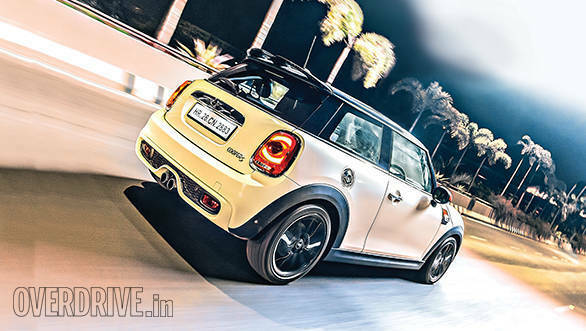 On a grippy surface, the Mini took 7.2 seconds to 100kmph which is 0.4 seconds quicker than the outgoing car. What the numbers won't tell you is how much stronger the mid range feels and that in turn results in a heightened sensation of speed. We didn't have the opportunity but hitting the claimed top speed of 235kmph seems quite realistic given the performance on offer. 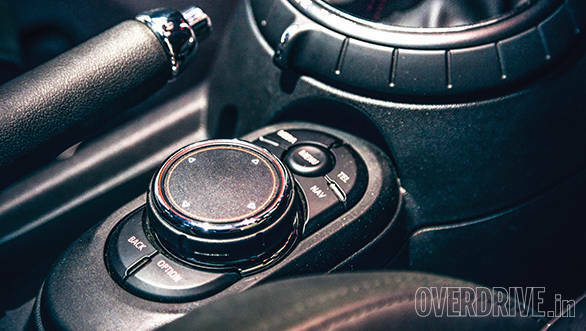 Mini offers three driving modes which are selected through the sliding switch that circles the base of the shift lever. Green softens throttle response and enables a coast function where the revs drop to idle while coasting. It also mutes the exhaust to the point where the car sounds quiet and drama free at low revs or cruising speeds. With the car in tree hugging mode, we got an overall efficiency of 10.4kmpl - quite good given the performance available. Then there's the normal Mid mode and Sport which offers the 'maximum go-kart experience'. It essentially weights up the steering, sharpens the throttle and firms up the optional dynamic dampers on our test car. The exhaust gets pretty loud and lifting off the throttle in this mode produces a series of burbles and pops. You can tell that a lot of effort has gone into perfecting the sound and while it may occasionally seem a little synthesised it's still music to the ears. I recently drove over 1,000km in the last gen Mini convertible and boy, did it hate bad roads. The car bounced all over the place and the heavy, communicative hydraulic steering would get sucked into every camber change and imperfection on a fast country road. It felt a bit like a rally car - exciting at first but quickly becoming tiring since it could never settle down. The old Cooper S was worse still. Two minutes in the new one and my first reaction was, 'wow, this actually works!' The car still feels firm and poised but there's a new found level of forgiveness in the suspension, probably down to those optional dynamic dampers. Mini claims that compared with the standard dampers they are softer in Eco and firmer in Sport. The car will still protest with a loud thud if it meets a pothole and considering that the tyres are runflats, it still needs extra caution. But on most roads ,the car rides well enough to be a daily driver and you won't start to hate it. Sticking with the standard 16-inch wheels instead of this car's optional 17-inchers should further help. The fabled Mini go-kart feel remains in that the front end is sharp and sticky and you can chuck the car around bends and it simply goes where you point it. But I do feel that the car is a little too large now to justify the go-kart moniker - I'd much rather call it a very well handling hot hatch. It simply doesn't have that tiny persona about it anymore, both from outside and behind the wheel. I do like the new electric steering which still feels responsive without being as reactive as before. The brake pedal feels firm and performance is strong enough to confidently counter the engine's brisk performance. For the price, I can't think of a single car that offers the same involving performance envelope. The closest, price wise, would be the Rs 60 lakh Audi TT. The first thing here is to give up on the idea that big money should equal a big car. At Rs 34.6 lakh, it costs as much as an entry level luxury sedan. 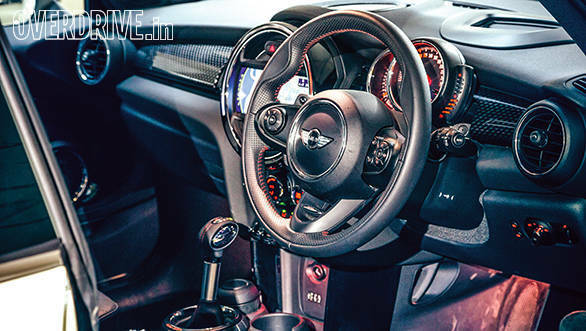 To a young, successful and preferably child free buyer who's looking for something exciting, the Mini Cooper S could be a realistic choice, even for a single car garage. But here's the shocker - that's just the base cost and our car wears options that raise the price by quite a bit; Rs 13 lakh to be precise. Factor in taxes and insurance and the on-road price jumps to close to Rs 60 lakh on-road which is very hard to swallow. Where does all that money go? Here are some of the more expensive options. Leather seats - Rs 1.5 lakh, metallic paint - Rs 85,000, the big sunroof - Rs 1.5 lakh. The lovely 12-speaker Harman Kardon system is Rs 1.25 lakh without which you'll have to settle for the standard six-speaker system. 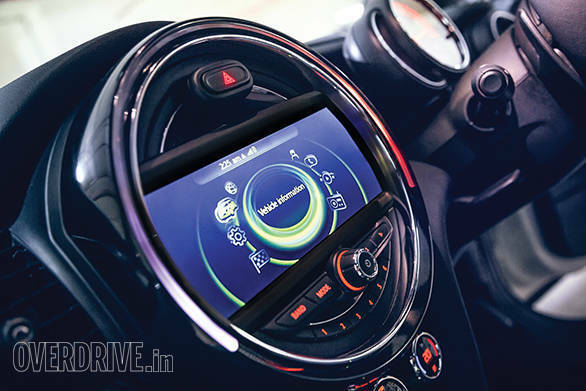 If you'd like navigation, that lovely 8.8-inch centre screen and the ability to stream music from your phone, it will set you back by another Rs 1.8 lakh for the Mini Wired Package. Want your mirrors to fold? Rs 35,000. Would you like those mirrors to auto dim at night? Another Rs 35,000. 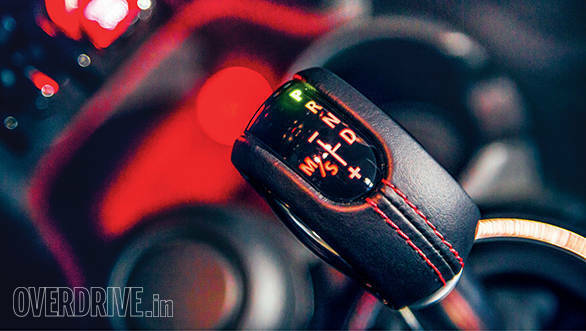 Of course you want keyless-entry-and-go, something most Hyundais offer - Rs 49,000. Rear parking sensors are standard but front sensors and a rear camera will set you back by over Rs 1.4 lakh! The list goes on frighteningly long. You can see all this for yourself on the Mini website and it's quite fun to customise a car of your own. I did that and with a bit of restraint, by only choosing the options I thought were necessary, like the dynamic dampers, sports transmission and Harman Kardon system (gotta have good audio! 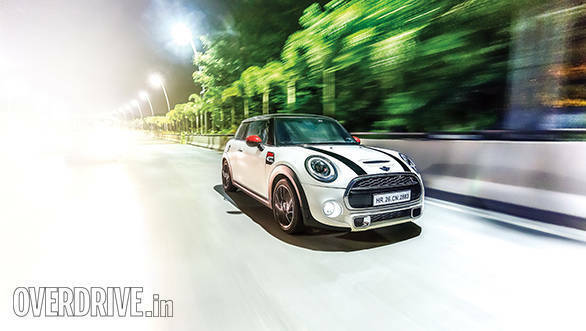 ), I had a Mini that retailed at Rs 37.3 lakh. That's still a very high price which was a difficult sell for the last gen car. But the new one is a much nicer machine and it now has that all important feel good factor. It's a hot little performer that you could actually live with in the real world. Buying a Mini Cooper S is still extravagant but it just got more justifiable.